"Clutter" can help you filter low-priority email, saving time for your most important messages. The email server keeps track of the email you read and the ones you don't. Once you turn it on, Clutter is automatic. As new email comes in, it takes messages you're most likely to ignore and puts them into the "Clutter" folder. The more you use it, the better it gets. And if you find Clutter isn't for you, you can turn it off. At the top left corner of the page, select the App Launcher icon, and then select Mail. On the top right corner of the page, go to Settings > Options > Mail > Automatic processing > Clutter. Choose Separate items identified as Clutter, then Save . You can turn Clutter Off anytime by selecting Don't separate items identified as Clutter. *Note The Clutter folder remains in Outlook after you turn off the Clutter feature. Clutter and junk email are both filtered out before they reach your Inbox. Junk email is evaluated and filtered first, then Outlook processes the rules (if you have set up any). Next, Clutter analyzes the remaining messages and filters out the types of messages that you usually ignore or don't respond to, based on your past behavior. As your reading habits change, Clutter learns and adapts. 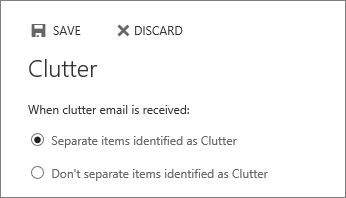 If you have Outlook 2016 for Windows, you can right-click the Clutter folder and choose Manage Clutter. You'll be directed to owa.findlay.edu to manage your Clutter options.